Peter Gregory, CISSP, CISA, has spent 20 years developing technology solutions for those who arent technologically oriented. He is an information security strategist for a wireless telecommunications carrier. Part I: Evaluating Your Virus Situation. Chapter 1: Understanding Virus Risks. Chapter 2: Does My Computer Have a Virus? Chapter 3: Does Your Computer Have Antivirus Software? Part II: Deploying Your Antivirus Defenses. Chapter 4: Obtaining and Installing Antivirus Software. Chapter 5: Configuring Antivirus Software. Chapter 6: Scanning Your Computer and E-Mail. Chapter 7: Ridding Your Computer of Viruses. Part III: Maintaining Your Vigilance. Chapter 8: Updating Antivirus Software and Signatures. Chapter 9: Installing Security Patches. Chapter 10: Using Firewalls and Spyware Blockers. Chapter 11: Protecting PDAs from Viruses. Chapter 12: Incorporating Safe Computing Practices. Part IV: Looking at Viruses under the Microscope. Chapter 13: Viruses and the Losers Who Write Them. Chapter 14: Trojan Horses, Worms, Spam, and Hoaxes. Chapter 15: How Viruses Function and Propagate. Chapter 16: Almost Ten Myths about Computer Viruses. 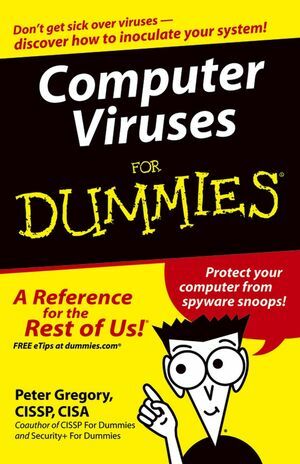 Chapter 17: Ten Antivirus Programs.